This confluence lies in the north part of Sichuan close to the Jiuzhaigou Nature Reserve. The trip came about since it was the May 1 Labor Day holidays, known as Golden Week in China since the entire country has the week off and is strongly encouraged to stimulate the economy by going traveling and spending as much as possible. It is absolutely the worst time to go, but given the schedules of work, it is one of the few times when one can get the time. I had planned to go with my wife, but she prefers a taking it easy and hates to deal with the crowds, but also understands my desire to get out once in a while, so she graciously allowed me to go without her. A few good friends from the soccer club I belong to planned to visit a soccer buddy, Irish Andrew Scanlon, who recently moved to Juizhaigou to work for the Juizhaigou Park Service. Having only four days, I decided to do the things I enjoy most, confluence hunting and cycling, so I brought my bike with me on the bus. The trip is about 400 km and usually takes about 8 hours. Arriving at the bus station, I knew from Andrew's experience that the bus would not have a large cargo hold, so I brought my bike bags to hold the frame and wheels. Upon releasing the rear wheel I was distressed to discover that the rear gear cluster fell off. The threads that held the locking cap on had sheared off. This could mean that my very brief ride to the bus station was all I was going to do. The bus was one of three leaving from the Xinanmen Bus Station at 8 AM for Jiuzhaigou. Other friends had bought tickets earlier than I and were on another bus. We left on time and made good time through the city with the streets deserted. Hitting the expressway to Dujiangyan, it appeared we would get to Jiuzhaigou in about eight hours. This being the first day of the May 1 holidays, it seemed that everyone was leaving town at the same time. The expressway ends at Dujiangyan and traffic was backed up to the tollgate. We inched as way through town, and passed the scene of a recent accident; an old woman was run over by a bus, with her head under the front wheel. The road narrowed to a two-lane highway, and traffic moved agonizingly slowly. It seemed like everyone had fled the city and was going to Jiuzhaigou. I was delighted to see scores of touring cyclists heading for the hills. However, I didn't envy their situation on the road; it was bumper to bumper on this narrow road with loads of diesel trucks and buses driven by frantic drivers all trying to get to where they were going as fast as they could, come what may. At one point we passed another accident; a bus had hit a cyclist and damaged the bicycle wheel. This was a precursor of events to come; our progress was halted several times by accidents that blocked the road for 30 minutes to an hour at a time. Noon came and went without a lunch break. I knew from experience what was going to happen. Once everyone was famished, the driver would stop at some rat hole in the middle of nowhere so there was no choice. I brought provisions to tide me over that, but my friends in the other bus fell victim and came out bitterly complaining of the food and praying they wouldn't get poisoned. The west road to Jiuzhaigou leads up the Min River valley and is being exploited for all its worth for it hydropower capacity. The crown jewel is the new dam just being finished near Dujiangyan. Once we got north of Maoxian, traffic thinned out a bit and we were able to cruise at a normal speed. However, the delays had set us back about four and a half hours, meaning we would arrive after dark. Andrew was expecting us and had prepared a banquet at his workplace cafeteria. I was the last to arrive and we had a great meal with about ten of us in total. We then went to the guesthouse where we stored our bags before heading out for a bit of socializing. We ended up at MCA, a brand spanking new Tibetan bar in Jiuzhaigou. Several tables around us were filled with performers from several of the troupes that put on shows for tourists. The women were still all gaudily made-up and they sang songs in Tibetan in unison, and came over to our table several times to toast us. Afterwards, we returned to the guesthouse. I had tried to recruit others to go with me on the confluence hunt, but there were no takers. Andrew desperately wanted to go, but felt he couldn't abandon the others since he had organized everything for the group. So I set my alarm for 5:45 AM so I could get an early start on the confluence. My plan was to enter the park and take the bus to the end of the southeast fork at Changhai (Long Sea Lake) and then start hiking from there. Andrew told me that it was forbidden to leave the trails and I would risk getting caught by one of the many guards they have placed around the park perimeter. The fine is a stiff 500 RMB (US$60), something I really wanted to avoid. Andrew had been up to the end of the road with his GPS and coached me on who he thought the path to the left of the lake would be the best way. He was hated to tell me this as he really wanted to go with me so he could be one of the first people at "his" confluence point and joked that he would warn the park wardens about my intents to stop me. It was just turning light as I made my way to the gate. A salesgirl on her way to work told me that her wages were 400 RMB per month. I asked her she thought the gate fee of 235 RMB was expensive and was surprised to hear her say no. Andrew told me that park officials were expecting 30,000 people to enter that day and they had all the office staff out in the park to put on a good front. This meant it would be even harder to avoid getting caught. Getting to the park at 6:30 AM, the gates were open, but the "green" buses were only taking the workers up to their posts, no tourists yet. I got on one bus and was told that I would have to change buses since that one would also be used for the workers. In changing, I had unknowingly left my camera behind and a bit later, the park tour guide came running over to my bus and gave me back my camera. What a blessing that was! I would be stopped dead in my tracks if I didn't have a camera. About 7 AM, my bus took off, but was going up the southwest fork, so I had to change buses midway and wait for one going up the southeast fork. While I was waiting, I saw an impressive number of guards and dark blue suited workers waiting around for park goers to pick up. This made me even more apprehensive about my ability to evade the long arm of the park rangers. But I also noted they were all wearing dress shoes, so maybe I had a chance. At 8:15 AM the first bus going my way came along. It was filled with Tibetans on their way to the work posts and gaily dressed in traditional clothes. As we passed a set of prayer flags, the entire bus got very excited as everyone rushed to throw prayer papers out the windows. Upon reaching Chang Hai (Long Lake), I immediately headed for the lake and found the path that Andrew had talked about. I went up it a bit and discovered a maintenance building of sorts with vehicle in the driveway. I reasoned that going past this would be asking for trouble, so I retuned to the lake path and took it down to the lake about 40 meters below the parking lot. There, I was delighted to find, was not a soul, so I made my way as quickly as possible several hundred meters along the east bank until I could go no further due to a cliff. From there I started climbing up into the forest. Here I was shocked to find a pristine lush undergrowth with pillowy soft lichen covering the ground and old man's beard moss dangling from the trees. It was a magical place, and couldn't believe my eyes at how wonderful it was to be there. After climbing for about 15 minutes, I got a call from Andrew who wanted to check up on how I was doing. I told him where I was and how excited I was to be there. He said he studied a detail map a bit more last night and told me there was a path that zigzagged toward the confluence point, and he guessed it was along the ridge. I told him I would go perpendicular to the lake until I hit it. Just as I ended my call, I heard a voice calling out to me, "Come down, come down." I saw an older man dressed in the communist blues about 20 meters below me. "Oh crap," I thought, "caught already." If there was only one of them and me, I felt pretty sure I could lose him. The woods are wide, dense, and covered with sound deadening covering that would make it easier to hide. However, I heard him call to some others and thought that if it was two or three against one, I would have much less of a chance. I decided I would make a run for it. While I didn't get a good look at him, he appeared to be a bit older, but he was probably an old hand in these woods and wasn't carrying a backpack. Still, I had about 20 meters of elevation as a head start, and for me, I was determined to try and get away. For him, I reasoned it was just a job, and he wasn't going to kill himself just to nab one stray hiker. Still, I didn't know if they had other methods like dogs or radio contact with other patrollers, so I made my way as quickly as I could stopping every few minutes to catch my breath and listen for sounds of approaching people. After initial eye contact, I never saw him again, but was concerned that he would call for help in tracking down the "intruder" so I kept up a brisk pace up the hill for more than an hour, stopping every few minutes to catch my breathe and listen for sounds of pursuit. It was during these rest stops that I realized how I was spotted; the woods are dead silent, and voices from the crowds at the viewing spots at Chang Hai could clearly be heard. If more than one person were to go here and wanted to be undetected, they would have to maintain strict silence for most of the time. It took about 90 minutes to reach the ridge, and there I could make out the barest of hint of a track from time to time. I followed the policy of that the ridge is my friend and from there I followed it up and up and up. A couple of times, I reach a peak, and had to descend a bit to continue up. From the ridge I could see a most impressive ring of snow-covered mountains towering around me. It appeared the only feasible route was to follow the ridge even though I was traversing parallel to the confluence point. At 11 AM I reached another high point with a thick patch mossy patch of luxurious soft green covering and the temptation was too great to resist; I laid down for a short nap, totally exhausted. A light rain woke me up, and I continued on my way. At this point I was 6.54 km from the CP, not much closer than went I started walking, and I had to resign myself to the fact that I would either have to spend the night in the wild, or turn back at some point with yet another "incomplete" visit to my name. I decided to go as far as I could until 1 PM and then call it quits. I still did not have a clear view of the way, and I thought if I continued I might gain some good intel for Andrew to try it later. At 12:30 PM I left my backpack on the ridge to pick up on the way back and fortunately marked a waypoint. The ridge snaked a circuitous route, and as I gained elevation, it became clear that this ridge would take me to the ridge at the ring of snow covered mountains, and from there one could cross the boundary into Mianyang where the confluence was located. 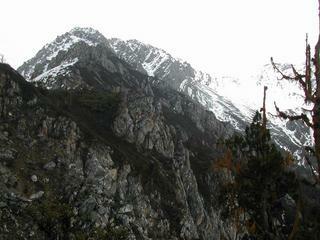 Unburdened by my backpack, I covered distance much more easily, and at last reached the tree line at 3,754 meters. A ragged stony ridge continued and I could see the connection to the pass. At 1 PM I stopped, took photos of the area and the GPS and started back. Even though I didn't make it to the CP, I thoroughly enjoyed my trek through the incredible forest area of at the back of Jiuzhaigou. I could now really appreciate the way the park service takes such a strict stance on visitors entering the protected areas. Getting back down was much easier, but then I had to try and find a way back through the patrolled zone so I wouldn't get caught. I figured taking the ridge would still be the best way, so if I did meet someone, I could take the opposite side to try and avoid confrontation. Once crossing the ridge on the side of the tourists, the sound of voices, even so far away could be clearly heard. Approaching the bottom, I spotted a thick underbrush and figured that it would be hardest to spot or track someone in that, so I went to it. It was about half sticker pushes and I paid dearly for this reasoning with plenty of scratches and cuts. After a good 20 minutes of that, I emerged onto a cattle track, which lead down to a dirt road. I could see the tourists and buses in the "safe" area and it looked like I would make it. Continuing on the road, there was a car and truck parked there, but the glare on the windshield glass prevented me from seeing if anyone was inside. When I passed the car, I discovered it was empty, but when I reached the pickup truck, I could see three blue-suited employees inside. They started to get out the truck and I said a weak, "Hello" and waved. I thought this is the watershed moment. They hesitated and then got back in the truck and left me to continue unaccosted. I guess they figured it was easier to just pretend they didn't see me than to confront me. I crossed the road, and the barrier to join the hordes of tourists walking down from Chang Hai, and silently rejoiced in my good fortune. Andrew sent a short message to my phone and said I was invited to join them at their camp near a village 15 km from the Park entrance/exit. I took the bus down, got my bike and had a good long look at the rear wheel and figured I could make it work if I removed the smallest cog and put in a spacer to take up the slack. Next I took a taxi to the village where I met Andrew and nine others for a Tibetan dinner on the balcony of the village leaders house. We invited the taxi driver to join us, but he wasn't made to feel welcome, so he waited down in his car until the dinner was over before taking his ride back to town. Our Tibetan host served us yak butter tea, tsampa, fried wild vegetables, and homemade beer during dinner. Afterwards he wanted to top it off with potent rice alcohol. I ducked out of sight at this point because the stuff tastes like gasoline, and the after burps seem to last an eternity. Guy said he loves the stuff and downed three glasses with our host. After dinner, we borrowed some blankets and started up the hill to the campsite, which was located about two hours away and 400 meters higher elevation. Darkness soon fell, as did the rain. We had three flashlights between us and arriving at the camp we were dead tired after a long day. The rain had soaked one of the blankets in the tent I stayed in and not having a sleeping bag meant having a freezing fitful sleep; I never shivered so much in my life. Andrew and Guy had a lengthy discussion about the Pope and condoms with the whole camp silently listened in on. When morning arrived, Andrew, Guy and I worked had to get a fire going, which was no easy feat given that most everything was soaked from the rain. Andrew had the foresight to cover some of the wood with his coat the night before, so it wasn't completely impossible, but still it took three of us about an hour to get a respectable fire going. A combination of bread and butter, eggs and coffee comprised our breakfast. Afterwards, I left the group to head back to the village to pickup my bike. Our Tibetan host helped me make a better fix on my rear gear cluster using wire instead of string. It felt great to be back on the bike again. Hiking is okay for short periods, but I prefer movement by bike, it lets my body keep up with my mind. It was downhill from the village through Jiuzhaigou and all the way to Shuanghe although I had a headwind that forced me to work my way down, a frustrating experience. Where I turned up the valley heading to Pingwu, the wind came strongly from the rear, making up for the difficulties earlier. The valley is quite steep and lush green. The combination with the clear stream and low traffic volume makes for a very enjoyable ride. The road continues up for 54 km with the summit at 3,350 meters, or about 2000 meters elevation gain from Shuanghe. A check with the GPS noted that the distance to 33N 104E is about the same as from the Jiuzhaigou Park entrance. The next day I continued south and set my sights on getting to Jiangyou or Beichuan and then taking a bus back to Chengdu. The day was gorgeous, the road was quiet; scenery is terrific. What a wonderful ride it has been. After a good night's sleep, I awoke to a beautiful day. The sun was shining and the temperature was cool. The road construction ended, thank God, and the road was in great condition. Traffic was light, except for a steady stream of buses from Mianyang to Pingwu. The mountains and river formed a perfect setting for a wonderful ride. The grade was also with me as I cruised down from the hills. At Guixi I had the choice of continuing to Jiangyou or turning off to Beichuan. The distances were 35 and 38 km, respectively, so I choose Beichuan because I hadn't been there before. From the font on the map, it seemed like a big enough place to support regular service to Chengdu. There was a five-km climb over the hill separating the two valleys and the road started out good, but then deteriorated to one-third gravel, two-thirds paved all the way to Beichuan. It was paved enough to make it seem not too unpleasant, but the view of the green mountains in this area more than made up for the shortcoming in the road condition. From the reaction I got upon my arrival in Beichuan, I surmised that it receives few foreigners. Here, after 140 km, I decided to take a bus to Chengdu, but my arrival at 3:50 PM was too late, tomorrow morning would be the next bus. So I opted for a bus to Mianyang and then another to Chengdu arriving home around 9 PM. It was so good to be home.